In earlier times meats and dairy products were excluded from the diet during Lent. As the end of the rigorous fast approached, people showed their joy and gratitude by taking their food to church for a blessing on Holy Saturday. They then reserved it for eating after the Easter Mass. The custom remains widespread in Eastern Europe among Christian of both Eastern and Western rites. Brought to the United States by immigrants, its popularity is increasing, and it has meaning for us today. As we celebrate the Easter feast of new life, we bless the food which sustains our physical life and our whole being. We express our joy and gratitude for the food which nourishes us. The foods traditionally blessed for Easter, the feast of the Lord’s Passover from death to life, are the foods which God prescribed for the ancient Passover meal: Lamb, Bread, Wine and Bitter Herbs. The Lamb, either meat of a symbolic lamb, or in the form of cake or butter, is the ancient Passover food by whose blood the Israelites were saved. Jesus is our Paschal (Passover) Lamb by whose blood we are saved. Ham celebrates the freedom of the New Lamb which came into effect through Jesus’ resurrection, in distinction to the Old Law which forbade certain meats. Sausage is an ethnic addition to enhance the celebration; its links remind us of the chains of death which were broken when Jesus arose. 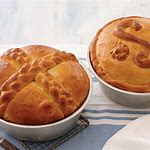 Paska Bread reminds us of Jesus, the Risen Lord, who in the Eucharist is the food of our earthly journey and the true bread of everlasting life. Eggs are a sign of home and resurrection. Jesus comes forth from the tomb as the chick breaks the shell at birth. Because of the special meaning, it is fitting that the eggs (pisanky) to be blessed be decorated with symbols of Easter, Alleluia, and so forth. Sirecz (Easter Cheese) is a traditional Slovak Easter dish made with eggs and milk, served with the Easter meal. This is served sliced and cold. It tastes like sweet custard. Horseradish represents the bitter herbs prescribed in the original Passover meal as a reminder of the bitterness and harshness of life in Egypt. It reminds us of the bitterness of Jesus’ Passion by which He entered into glory. Wine is the drink of the Passover meal and the Last Supper. Its sparkle reminds us of the glory of Easter. Everything for the Easter meal may be blessed. The custom is to reserve the eating of the blessed food until after the Easter Mass. Children’s Easter Baskets owe their origin to this custom of bringing baskets of food to church for blessing. Their baskets of candy and eggs may be included in the blessing service.